Location: Located at the south-western edge of the village, set back within its churchyard to the NW of the Henllan to Trefnant Road. Memorial church erected between 1853 and 1855 to the memory of Colonel John Lloyd Salusbury of Galltfaenan Hall by his daughters Mrs Townsend Mainwaring and Mrs Charles Mainwaring. The church was designed by Sir George Gilbert Scott, architect of London and was conceived in his characteristic 'middle-pointed' style of the late C13/early C14. A lavish commission, the arcade columns and capitals were made of polished Mona marble and given a profusion of naturalistic foliate carving by the Denbigh mason Mr J Blinstone. This was undertaken under the direction of the architect who took the mason off to London for instruction and who later professed himself particularly pleased with the result. A vestry was added by Sir Giles Gilbert Scott in 1907 under the patronage of Colonel Charles Salusbury Mainwaring, also of Galltfaenan Hall. Memorial church in early Decorated style; of uncoursed, dressed limestone blocks on a slightly-battered plinth and with limestone dressings. Steeply-pitched roofs, saddle-backed to aisled nave, of (original) copper-coloured Westmoreland slates; oversailing eaves with kneelered gable parapets and overlapping copings with stone gable crosses. Large gabled, twin-arched bellcote to eastern nave gable, with tall trefoil-headed bell openings and cruciform carving to recessed oculi on both W and E faces; surmounting gable cross. Gabled S porch with pointed-arched outer entrance and moulded label returned onto carved head stops; geometric side lights of two conjoined, cusped triangles with quatrefoil oculus over. Heavily-moulded inner arch with similar label stops and decorative ironwork to boarded doors; two contemporary Gothic iron footscrapers flank the porch entrance. Two-light tracery windows flank the porch, with carved head stops to returned labels; the windows break the eaves and are contained within elegant gables. Tall 2-light W window with tracery head and returned label as before; flanking buttresses define nave and aisles, the latter with tall single lancets to the ends. Three further, similarly-gabled windows to N aisle. Stepped-up S door to chancel with pointed outer and trefoil inner arch; boarded door with decorative ironwork. The entrance has a coped, steeply-gabled canopy, supported on double corbels; contemporary iron foot scraper, as before. Large 3-light E window with Decorated tracery to head and carved label stops as before; stepped buttresses flank, that to L angled. That to the R is straight and marks the division between the chancel and the flush adjoining N chapel. In the valley between the gables is a fine 2-stage chimney with broach-stopped chamfered edges and crenellated capping. 2-light E window to N chapel with paired trefoil-headed light and surmounting quatrefoil oculus within a large, blind, pointed arch with cross carving to its upper section; in the western gable apex a tracery oculus. Stepped buttress as before to NW and NE corner, the latter angled. Adjoining the N chapel to the N is the single-storey early-C20 vestry; construction as before on a battered plinth and with similar slate roof. Squat chimney with moulded capping to coped N gable. Segmentally-arched boiler entrance to E face at L. To the R, two squat 2-light Tudor-arched leaded windows with cusped lights and depressed ogee to moulded top; continuous label course. On the W side is a stepped-up entrance to the R with moulded, pointed arch and returned label; boarded door with decorative ironwork. Fine clustered scissor-truss roof to tall nave, on stone-corbelled wall plate. Four-bay arcade with pointed limestone arches and moulded sandstone labels; these with carved head stops. The arcade columns are of polished Mona marble on moulded limestone bases. Naturalistic foliage carving to capitals, each representing different plants or leaves observed from nature. Engaged half-columns to W and E ends with similarly-carved capitals and corbel supports. Black and red quarry tile pavement and original pitch pine pews with shaped and moulded pew-ends. Early English style font of Llaniestyn red-stone (from the Marquis of Anglesey's quarry) with three different additional types of marble; large basin on a moulded base with 4 columnar supports with naturalistic foliage capitals. The whole is raised up on a tooled limestone plinth of cruciform plan, with steps on all sides; moulded top with fine wrought iron decoration to wooden font cover. Square pulpit of similar style and material with marble stepped access; engaged corner columns, moulded base and top and a central quatrefoil with the Christological monogram. Simple roofs and similar pavements to aisles, with tall tracery windows breaking the eaves. Their gables are supported internally on fine foliated corbels. Returned, moulded label to S entrance inner face, with further carved heads as label stops. Fine contemporary grisaille stained glass to W window, by James Powell and Sons. Commemorative figurative stained glass windows to the aisles, that to the S aisle and two to the N aisle are to Townsend Mainwaring, JP, MP, of Galltfaenan Hall, (d1884) and include heraldic panels. That to the E end of the N aisle is to Whitehall Dod of Llannerch Hall (d1878). Various C19 and C20 wall brasses, chiefly to the Mainwaring family. Fine chancel arch with engaged outer columns and inner half-columns; foliated capitals and corbels, with double-moulded, pointed arch of sandstone and complex vinescroll carving to both nave and chancel sides; head carving to label stops. The chancel is stepped up and has a pointed waggon vault, compartmented with wooden moulded ribbing and Perpendicular-style gilded and polychromed shields and bosses; Brattished wall plate with similar carved, foliate bosses. The chancel has been stripped of its plaster. Inlaid marble floor (in memory of W P Jones of Llannerch, 1955) and similar to stepped-up sanctuary. Two further grisaille windows by Powell and Sons to S side. Large E window with stained glass depicting the Passion and commemorating Col. John Lloyd Salusbury (d1852) and his wife (d1846); by William Wailes and signed with monogram and dated 1854. Fine oak choir stalls in Arts and Crafts Perpendicular style, commemorating W C Jones of Llannerch Hall, 1909; blind and pierced tracery to bench ends and frontal carving. The sanctuary walls are panelled with fine, re-used oak arcaded carvings with intricate wreathed heraldic shields; these were taken from Kinmel Park in 1936 and installed to commemorate W D Williams. Simple, contemporary oak altar rails with fielded posts and moulded rail. Great War commemorative marble tablet to N wall; by Sir Giles Gilbert Scott. Large pointed sandstone arch off chancel to N chapel, with columns and detailing as nave; decorative wrought-iron scroll-work screen within. Narrow pierced Perpendicular oak screen to N chapel from N aisle, also by G G Scott; in memory of R F Birch, d1915, central panelled door. C14 style parclose screen to (original) vestry at E end of N chapel, with moulded and cusped tracery to upper section and panelling below; central entrance. Above, the contemporary organ loft with central organ; in Perpendicular case with flanking ogee-arched screen sections. 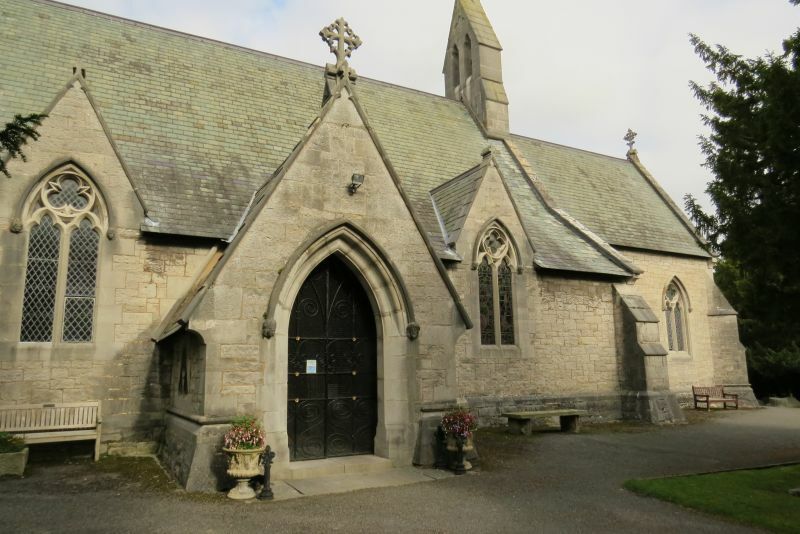 Listed Grade II* as a highly-important and relatively unaltered memorial church commission by the foremost Victorian ecclesiastical architect, the focus of a parochial group by the same hand. Group value with the Rectory, school and school house. Located on the roadside, set back on the edge of a pavement, approximately 80m SE of the crossroads between the main road, Nant-y-Park Road and the B5381. Located immediately to the NW of Plas Newydd, partly enclosing a cobbled service court. On the road-side at the northern boundary of the community.